Do you know someone who is welcoming a new cat into their family? 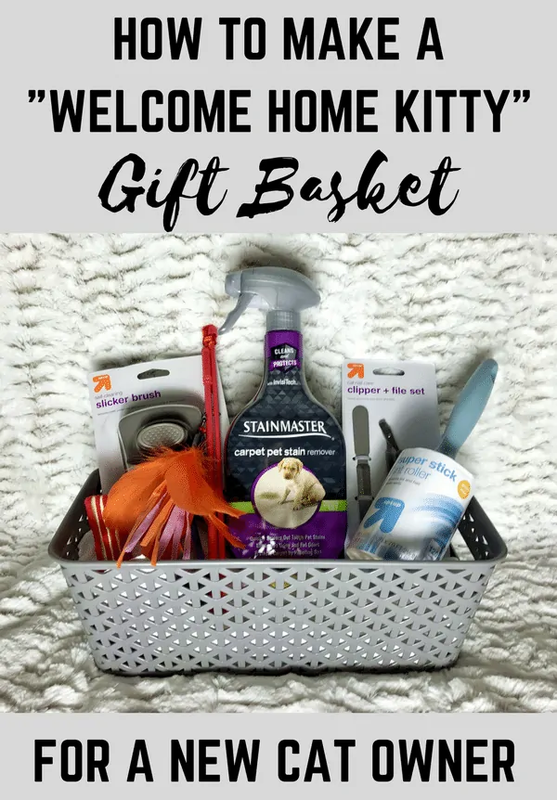 This fun DIY “Welcome Home Kitty” cat gift basket is filled with goodies for kitty and makes the purrfect gift for new cat owners. As a cat mama to 2 fantastic felines myself, I get pretty excited when a friend of mine is bringing home a new cat or kitten. There is just something about those little paws and that cute little nose that melts my heart! Having been a cat owner for nearly 20 years, I have a pretty good idea of all the things someone will need when then bring home their first cat. I decided to do some shopping and create a “Welcome Home Kitty” gift basket, filled with goodies that every new cat owner will need. Homemade gift baskets always beat store bought presents, so I knew that making my own cat gift basket was the way to go. 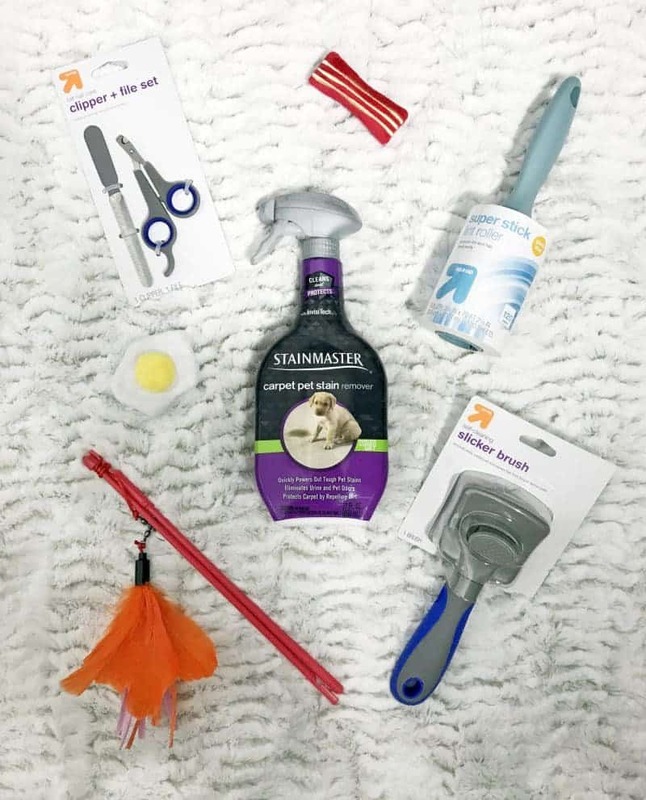 Interested in including STAINMASTER™ Carpet Pet Stain Remover in your “Welcome Home Kitty gift” basket? Simply hover over the product in the photo above to click through to Target.com and purchase it. Start by finding a basket that is strong enough to hold all the cat gear you will be filling it with. When picking out a basket, keep in mind your friend's taste and home decor, as you will want to select a basket that he/she will be likely to reuse in their home. I selected a nice and sturdy grey basket that I think will be great for storing cat toys in my friend's house. Speaking of cat toys, pick up a few different kinds of cat toys. I chose adorable bacon and egg catnip-infused toys and a feather teaser wand. Occasional messes are just the reality of owning a pet. Kittens have accidents when learning to use the litter box, and older cats can have accidents, vomit, and spit up hairballs. Do your new-cat-owning-friend a favor and include a bottle of STAINMASTER Carpet Pet Stain Remover in their gift basket. 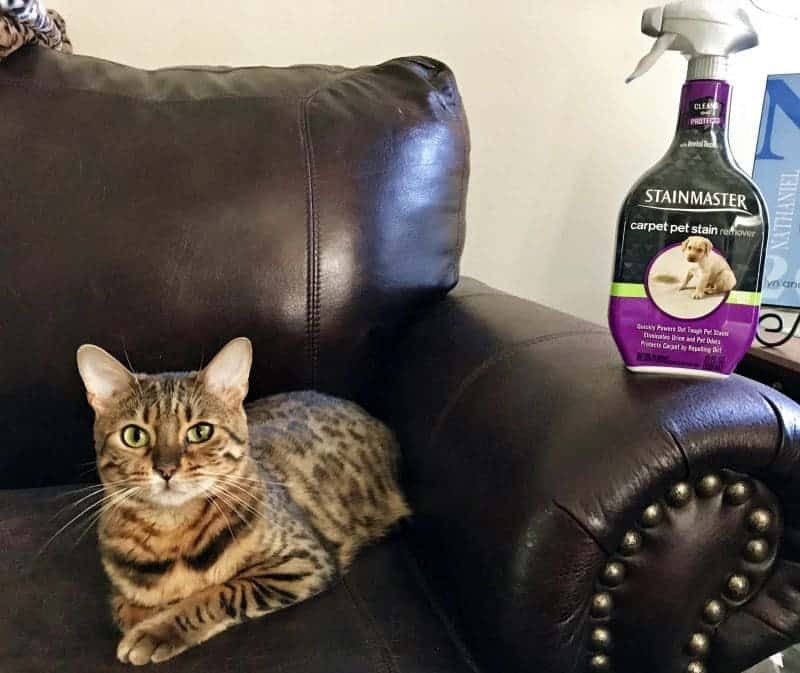 STAINMASTER Carpet Pet Stain Remover lifts away even the toughest of pet stains leaving behind no sticky residue. Its ODOR REMOVE™ technology works to eliminate the stubborn odors that come along with pet stains. 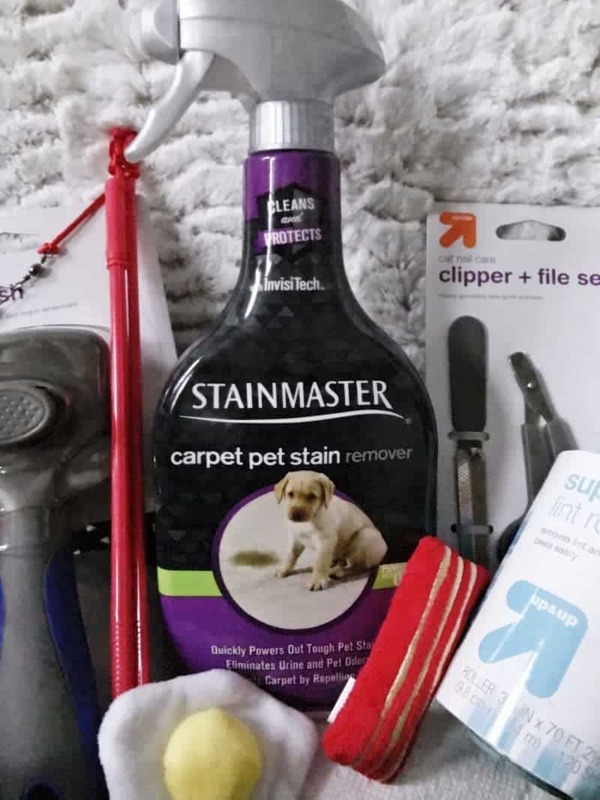 Plus, STAINMASTER Carpet Pet Stain Remover leaves behind an invisible shield that works to repel dirt and protect the carpet from future stains. How awesome is that? 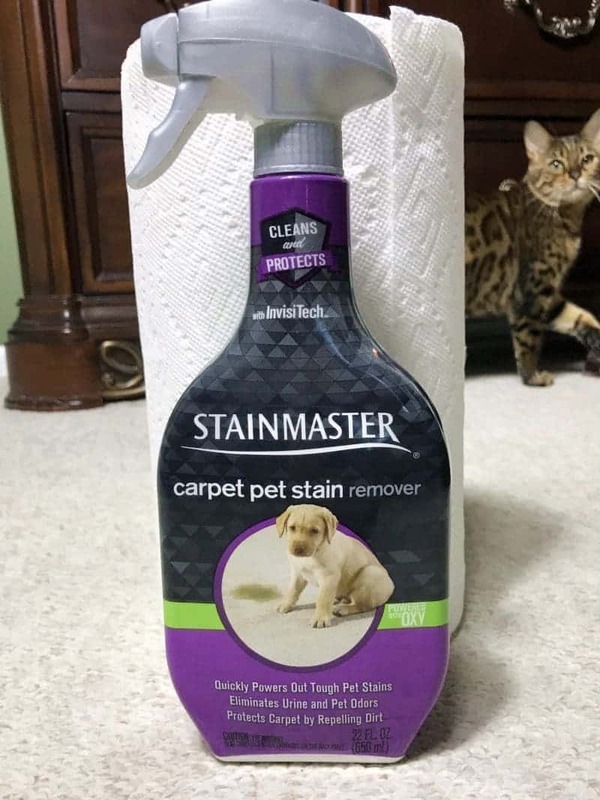 STAINMASTER Carpet Pet Stain Remover is not only perfect for all sorts of pet stains, but it works just as well for everyday messes such as coffee, grape juice, ketchup, soil, chocolate syrup, jelly, and even motor oil. 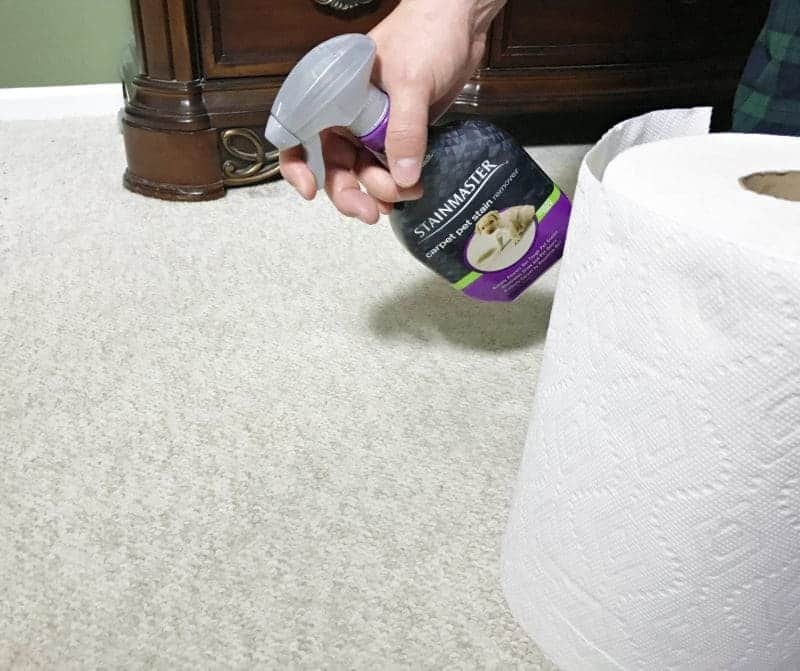 During the Fall it seems that the outdoors are constantly being tracked indoors, and STAINMASTER Carpet Pet Stain Remover does a fantastic job keeping my carpet clean. That's why a bottle of STAINMASTER Carpet Pet Stain Remover should be in every pet owner's cleaning supplies cabinet. A lint-brush will definitely make a nice addition to your cat gift basket. Cat hair clings to clothing and a lint brush works will to remove it in a flash. Every cat owner needs a pair of nail clippers to keep kitty's nails nice and short. Kitty will need a grooming brush to keep their hair nice and silky, as well as minimize hairballs. Now that it is Fall and there is a slight chill in the air, kitty will love snuggling up in a warm and cozy blanket. Materials such as fleece or faux-fur are perfect for warmth. Target makes the perfect one-stop-shop for your DIY cat gift basket. 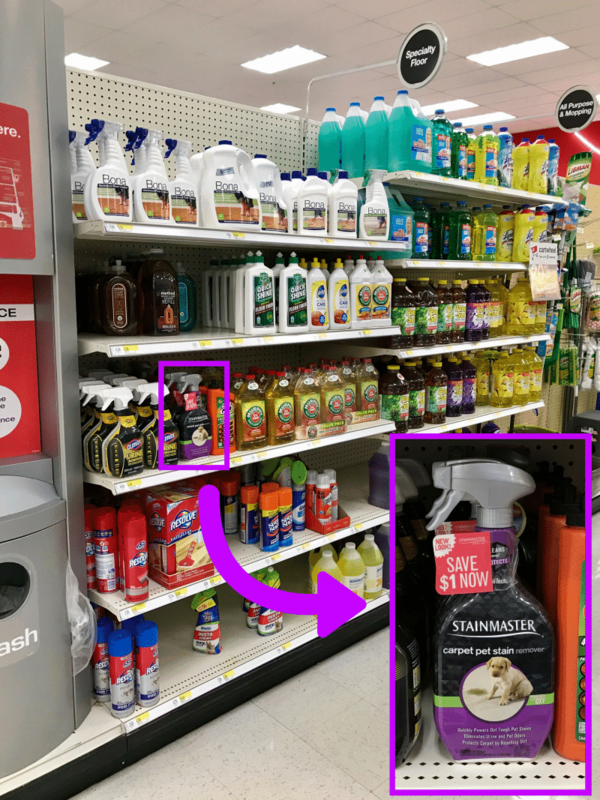 All the products that you will need are easy to find at Target. STAINMASTER Carpet Pet Stain Remover can be found in the cleaning aisle near the other floor cleaners. The basket can be picked up in the home goods section, and all of the cat items in the pet aisle. Once you have gathered all of your gifts, simply place them into the basket and your “Welcome Home Kitty” gift basket is ready to gift. Your friend, and their new pet, are sure to love it! Great idea for a new cat owner! I can’t think of anyone who wouldn’t appreciate a thoughtful gift basket like that. What a great idea for a new cat owner! Going with Stainmaster brand is definitely the way to go. I use the pet carpet care products from them all the time. They work awesomely! That is such an awesome idea! A first time pet owner never knows everything that they’re going to need, so giving them a little “welcome to pet parenthood” basket is wonderful. What a cute idea for a new cat owner. I think the lint brush is a must have! Love this. We have friends that are in the process of adopting a new kitten so this would be perfect. This is such an awesome idea! We are thinking about getting a kitty… I hope our friends think of this! This is such a cute idea. I never had a brush for our cat. What a fun idea!! I haven’t owned a cat since I was a teen, would be fun to get these as a gift if we were to get a cat. It’s amazing how much they need when you first get a cat. Thanks what a wonderful idea and my son just got a new kitty!! What a sweet idea, would be nice for a new cat.